This can be made using either sugar or Jaggery. But the best taste is obtained when it is made with Jaggery. 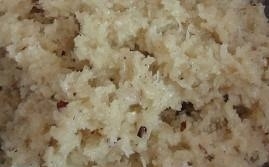 Grate the coconut (only the white portion should be used).In a hard bottom pan add jaggery and 1/5th cup of water. And when the jaggery dissolves in water and when it starts bubbling add the grated coconut and powdered cardamom. Lower the flame and let the coconut and jaggery mix together. Untill the consistency becomes sticky, keep stirring the mixture. When cold transfer to another container and use it to make Modhak or coconut poorna kozhukattai. To make the same with sugar: Add 1/4 cup of water to sugar. Bring it to boil and to one string consistency. Add the grated coconut and keep stirring it continuously without leaving the laddle. Add the cardamom powder and stir untill it leaves the sides of the pan. Use this pooranam to make either Thengai Poorana Kozhukkattai or fried Modakam or Thengai Poli.